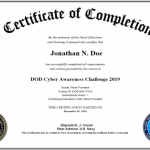 The Defense Information Systems Agency (DISA) has released The Cyber Awareness Challenge. This will be the latest and greatest Information Assurance (IA) training for October 2013. The link is below. There are two versions, one for the Department of Defense, one for the Intelligence Community, and one for the remaining Federal departments and agencies. 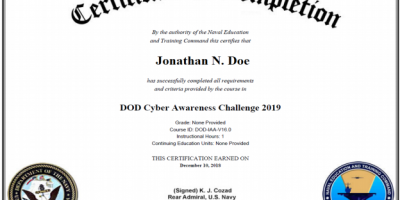 If I complete all the modules of the Cyber Awareness Challenge by clicking on the link to “Launch New CyberAwareness Challenge Department of Defense Version,” does the program print a completion certificate at the end? Yes, once you complete the training you should be able to print out the certificate at the end. Be sure to use IE. We have noticed issues when using Chrome.